I am a small town boy. Born March 9, 1939, I grew up in Yankton, South Dakota, the last upstream steamboat stop on the Missouri River. Yankton’s history reaches back to the Sioux Nation, from which the town draws its name. Lewis and Clark parlayed with the Lakota there. Decades later, it became a jumping off point for homesteaders, a campsite for Custer, a territorial capital, and in the 1920’s, the home to WNAX radio that once boasted it broadcast from the highest radio tower in the world. Huckleberry Finn would have felt right at home under the shade of the Hackberry and Elm trees. My father, Joseph M. Hohn, was the sixteenth child of a family of seventeen and the only one to receive a college education. He became a dentist and practiced in Yankton until his death in 1980. Dad and mom were veterans of the Dust Bowl. “Nobody had any money,” mother would explain. “Doc would get up in the morning and find a chicken and some turnips on the front porch from a patient as payment.“ Mother, Ileen Carlon Hohn, was an elementary school teacher. Mother followed Dad out of life in 1985. Of the three children born to them, I am the middle child. First Published . . . I have been writing all of my life. I first published at age 10 in the nationally circulated Pilot magazine with a four line verse that concluded, “You are always trying these foolish acts. When will you learn to trust known facts?” I placed first in a nationwide contest sponsored by “G. I. Joe” comics. In less than 25 words, I told the world why I wanted to be like G. I. Joe. My prize was a five-year subscription, an award I outgrew within a year of accepting it. The middle 1950’s were a great time to be coming of age. World War II, although a fresh memory to our parents, was ancient history to the adolescents of the era.. Hard top convertibles with wrap-around windshields were capable of accelerating to 60 miles per hour in 8 seconds. Elvis, Bill Haley, Fats Domino, Buddy Holly—shboom baby! The music took a turn during the era and never looked back. 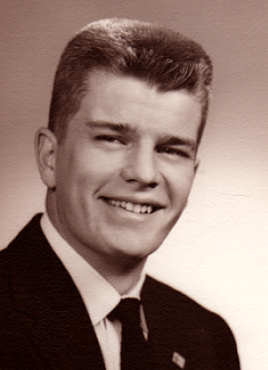 I graduated from Yankton High School in 1957, turned down a Navy ROTC scholarship to marry my high school sweetheart, Elaine Finfrock, and began my college years at St. John’s University (MN) where I earned a degree in English in 1961. Upon graduating, I began teaching at St. John’s Prep School. In 1964, began a 40-year career in the financial services industry during which I held positions with The Travelers, Blue Cross/Blue Shield of Minnesota and Wilson Learning Corporation in Minneapolis. In 1978, I moved to Winston0saelm North Carolina and signed on with Wachovia Bank and Trust. I retired at the end of 2007 after 15 years as a Financial Advisor with Merrill Lynch serving over 300 clients in the Central Atlantic area. That I have spent with you. With my marriage to Melinda, I became a stepfather to her son, Matt. Melinda and I divide our time each year between our cottage near West Jefferson, NC and a home in Winston-Salem where we spend the winter months. Both locations feel like home. My stepson visits us with his family in both locations, and my own children are frequent guests as well. I completed my first novel, Deadly Portfolio: Killing Hedge Funds in 2010. The book was well-received and readers wanted more of its central character, Detective James Raker. In 2014, I published a sequel entitled Breached which is based in the Blue Ridge Mountains of northwestern North Carolina. The arts have always been an active interest. I am a past president of The Youth Symphonies of Greater Minneapolis, a member of the Winston-Salem Symphony Chorale, and on stage frequently in Little Theatre productions in Winston-Salem and the Winston-Salem Theatre Alliance. In 2000, I published a small book of poetry. In 2016, Gene Johnson and I founded 40+ Stage Company in Winston-Salem and launched our first season the following spring. In February, 2019, I appeared with Robin Voiers in the 40+ Stage Company production of Love Letters. 40+ Stage Company is dedicated to providing class and performance opportunities for anyone 40 years of age or older who is interested in the stage. At the start of the year 2019, I stepped down as Chair of 40+ Stage as my friend David Piner took over. I turned 80 in March of the same year. I continue to write poetry and appear occasionally at open mic readings. My third novel, tentatively titled, Ponzi by the Sea, is underway and I hope to have it completed by year end.